This morning Facebook COO Sheryl Sandberg officially launched “Lean In,” a non-profit organization aimed at creating a global community that encourages women to continue to be active and ambitious in their careers even as they start families. The launch of the organization, which Sandberg co-founded with Rachel Thomas, comes less than a week before Sandberg’s highly anticipated book, Lean In: Women, Work, and the Will to Lead is set to make its debut on March 11. 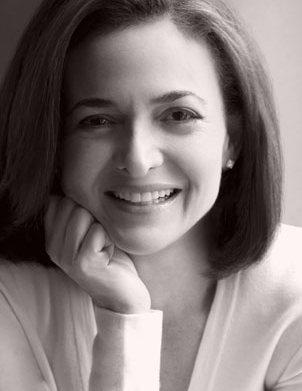 All the profits from the book sales will go into LeanIn.org, and Sandberg has also contributed her own funds to the organization. Not surprisingly, the onboarding experience at LeanIn.org is heavily integrated with Facebook. In order to join the movement, share your own story, receive updates, and the like, you are asked to sign up for the Lean In page with your Facebook profile. Once you’ve done that, you’re then directed to “Like” the Lean In page to receive extra tips and written updates. It’s a clear sign that, despite the speculation that Sandberg may be looking toward a long-term move into the political realm, as of now she is still heavily invested in her day job. It’s a big worldwide movement, but it is ultimately rooted in the small and local realm. The organization wants people to create their own “Lean In Circles,” small groups “that meet regularly to share and learn together—like a book club focused on helping members achieve their goals.” Lean In provides “Circle Kits” to provide an outline for disucssion. And while Circles are meant to have a big in-person element, Lean In also has an online space for organizing the group and staying connected with it. To create a circle, you can either log in through Facebook or create a profile with a user name and password. “Because what I have seen most clearly in my 20 years in the workforce is this: Women almost never make one decision to leave the workforce. It doesn’t happen that way. They make small little decisions along the way that eventually lead them there. Maybe it’s the last year of med school when they say, I’ll take a slightly less interesting specialty because I’m going to want more balance one day. Maybe it’s the fifth year in a law firm when they say, I’m not even sure I should go for partner, because I know I’m going to want kids eventually. With the new book as well as the organization, Sandberg is encouraging women to push back against that status quo, and instead lean in to their careers — and encouraging men to support them in that.